Raghav joined NEA as an associate on the healthcare team in 2018. 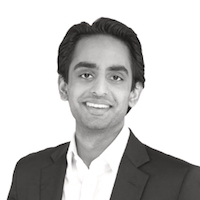 Prior to joining NEA, Raghav was a member of Lazard’s healthcare M&A group in New York. At Lazard, Raghav worked with clients across the life sciences, medical device, and healthcare services sectors. Raghav graduated from the Roy and Diana Vagelos Program at the University of Pennsylvania, where he earned a B.A. in Biology from the College of Arts and Sciences and a B.S. in Economics from the Wharton School. During his time at the University of Pennsylvania, Raghav conducted both laboratory research and advisory work related to engineered T cell therapy for oncology.